I started today at the street market in Luang Prabang, Laos at 8 this morning. Just your typical day, strolling through cobblestone lanes between Buddhist temples, checking out delicacies on offer such as freshly-gutted tadpoles, live wriggling larvae, water buffalo ears and live snakes. Have you ever watched any of those cooking shows, such as Chopped or Master Chef, where contestants are given a basket of “mystery ingredients” – many of them quite exotic and challenging to say the least – and must whip something up with what they’re given? As a major foodie and cook, I love these shows. Strolling the morning market in Luang Prabang with Somroj Mepiern, Executive Chef of Hotel de la Paix, this is what was going through my mind. Just what would a chef contestant on one of these shows do with honeycomb filled with larvae, duck feet or dried squid? In fact, Chef Somroj won a major cooking competition in just this way. Somroj, who is a multiple award-winning chef from Thailand, was awarded the Best Dish on Koh Samui Island for just such a competition, where he was handed a basket of ingredients and had to create his dish from what he was given. Not sure what was in the basket, but Chef Somroj is definitely creative. “Lao food is not well-known in the rest of the world,” Somroj tells me as we stroll the market. As part of the Culinary Experience offered by Hotel de la Paix, the Chef begins cooking school by taking his students to the market. Afterwards, you return to the beautiful hotel property to commence your cooking lessons and whip up four different fabulous recipes. 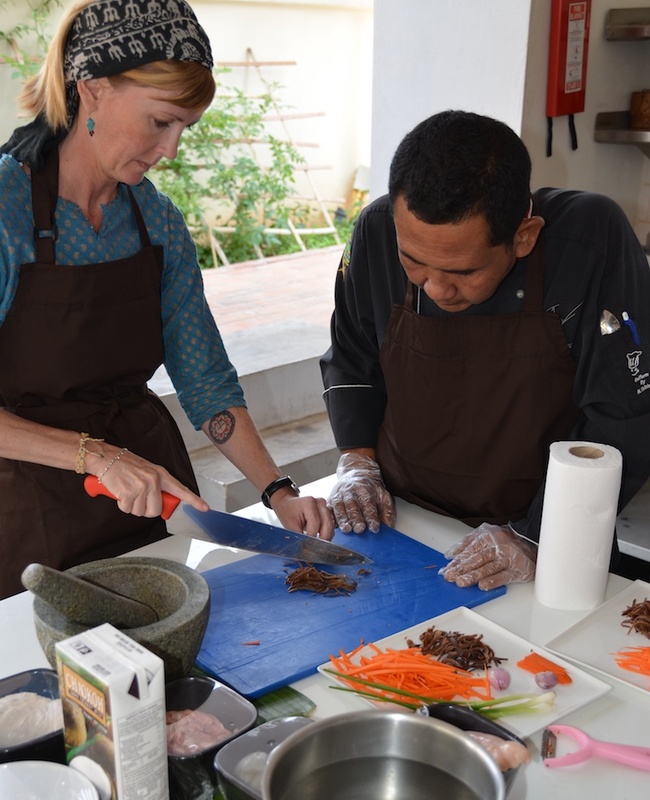 “Many Asian cuisines are popular throughout the world,” Chef Somroj continues. 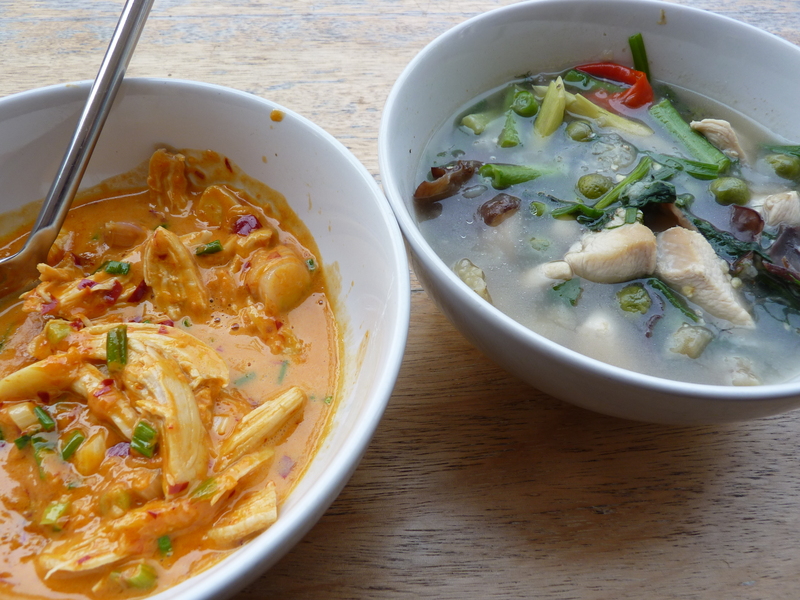 “Thai, Chinese, Indian…but most people have yet to discover Lao cooking.” He explains that in many ways it has similarities to Thai food, but is generally much less spicy. I find similarities to Cambodian food as well. One interesting aspect of eating in Laos is that this land-locked Southeast Asian country is the only Asian country that eats sticky rice, rather than steamed rice, almost exclusively. The Luang Prabang morning market is bustling, and besides the slightly disturbing (to a Westerner) items for sale, there are also a plethora of beautiful vegetables, aromatic herbs, poultry, meat and sweets. After a couple of hours we return to the hotel for the cooking class to begin. I was very excited to learn how to make this dish, having eaten it the previous day for breakfast. A savory combination of a spring roll and a French crepe, this dish served with a sweet-and-tangy peanut sauce already had my love. After slicing thin julienne strips of carrot, mushroom, shallot and green onion, Chef Somroj led me in sautéing the vegetables along with minced pork, then adding some soy and oyster sauce, salt, pepper and a pinch of sugar. The crepes were interesting to me – these were made with rice flour and steamed, not pan grilled. The thin crepe mixture was poured onto the steamer flat surface, covered for three minutes, then rolled off with a bamboo stick. You then stuff the crepe with the pork/vegetable mixture spring-roll style, and serve with a sauce made of soy sauce, a bit of palm sugar and crushed peanuts. 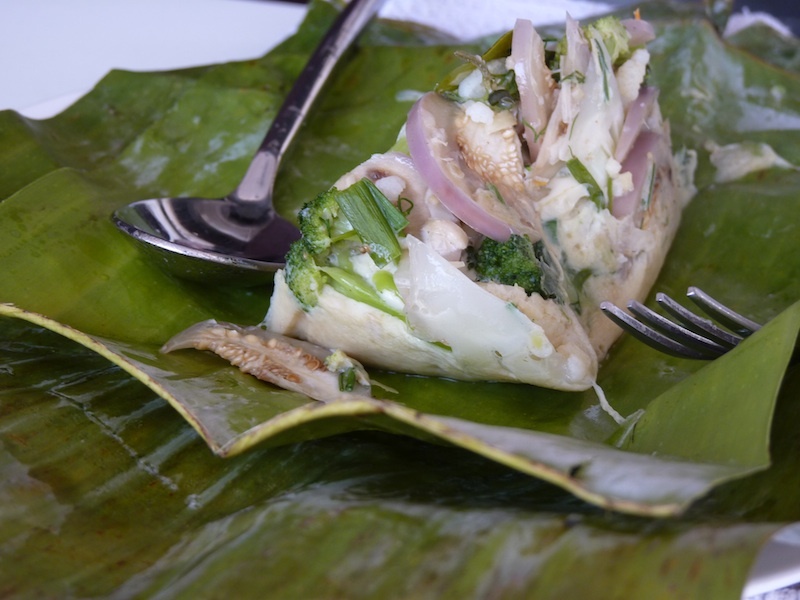 I love anything steamed in a banana leaf – I think it’s an absolutely brilliant way to cook. 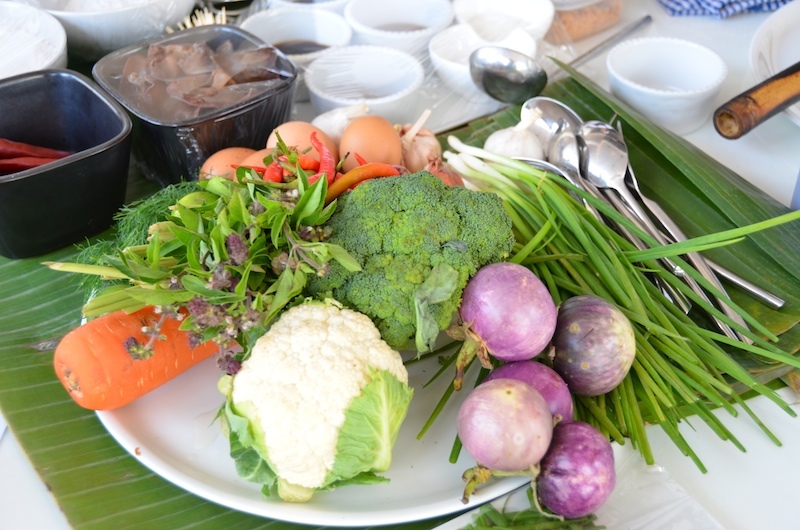 This dish consisted of grinding sliced lemongrass, shallots and Thai chilies with a mortar and pestle, to make a paste. Into this you add your chopped vegetables; we used cauliflower, eggplant and broccoli but you could really use any veggies. Then in go the herbs: dill, basil and Kaffir lime leaf, with a little green onion. For the sauce and seasoning, Chef Somroj mixed some tapioca powder into water, adding fish sauce, a little salt and sugar, and an egg. Once this entire mixture was stirred together, it was all folded into a banana leaf and steamed for 15 minutes. Not only delicious, but beautiful and quite a dramatic presentation. This one goes on the “serve at dinner parties” list, and I think it would be fabulous with added shrimp or other seafood. This traditional Lao soup is made with a plain water base, adding chicken along with garlic, shallots and whatever vegetables you wish. The secret weapon of this soup is the eggplant paste; using pre-boiled small Asian eggplants, Chef removed the skin and threw the soft eggplant meat into the mortar to mash, then threw the paste into the soup. Chef taught me how to easily make my own chili paste – I had no idea it was that simple. Three ingredients: garlic, shallots and large dark red chilis. Simply mash them all together with a mortar and pestle, and viola! You have chili paste. You then fry this paste in some oil until it starts to “crack,” then add coconut milk. A bit of the obligatory oyster and soy sauces, sugar and salt are thrown in, along with freshly sliced shallots and garlic and pre-cooked chicken (or whatever meat or vegetables you wish to use). A sprinkling of fresh sliced green onion is last. This curry dish was very similar to a Thai curry, but it definitely tasted different. A bit less heavy and rich perhaps, and less spicy. All in all, it was a great day with Chef Somroj, who has been cooking since age 17 when he became an apprentice in a hotel restaurant. After working for Le Méridien Hotels & Resorts for a number of years, Chef was recruited to the Hotel de la Paix in Luang Prabang shortly after it opened a year ago by Greg Seddon, Director of Sales and Marketing for the hotel, who has worked with Somroj previously at Le Méridien in Thailand. As I discovered, Lao food does indeed have its own distinct flavor and style, and is quite interesting and unique. If you visit this charming, laid-back town you can’t go wrong with a day of market-shopping and cooking classes with Chef Somroj and Hotel de la Paix. And, you won’t leave hungry.